It’s been about ten years since I had my eyes lasered. My vision was deteriorating and I absolutely hated wearing glasses so it felt like a good option and my vision is still generally great now. However I have started a new job which involves a lot of PC work and my vision is getting hazy at times so I decided to get them checked out. Although my vision is still good, it has dipped a bit and I was advised that glasses would help. However, I am still not a fan of wearing glasses and instead turned to researching daily lenses for the times when I wanted to support my vision. 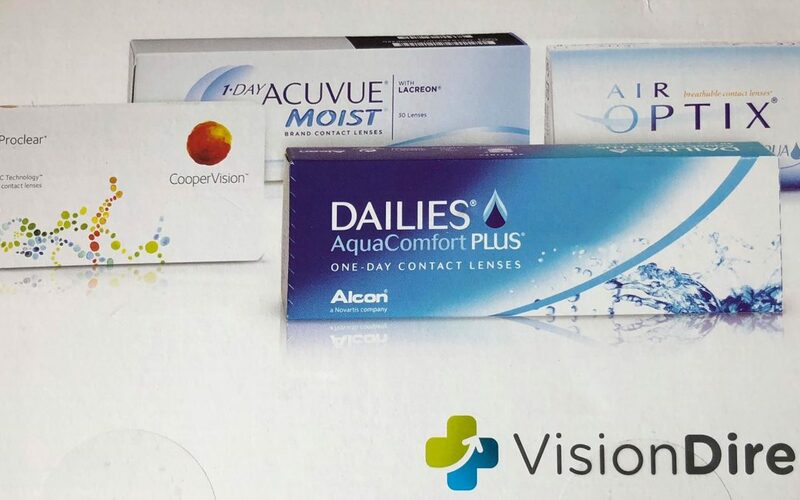 I decided to go with Vision direct at the end because they offered next day delivery (and I hate waiting for anything! ), I knew I could order whatever I wanted, whenever I needed them and they had the same brands as high streets anyway so it was win win. 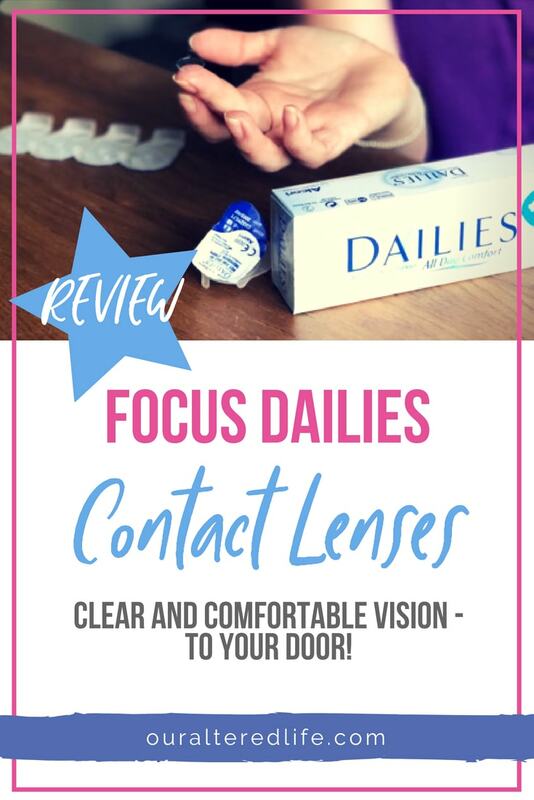 I opted for their Focus Dailies contacts range as I don’t actually need to wear them all the time and this gives me the flexibility to wear and discard them at the end of the day. When they arrived I was surprised (and impressed) to find a little bag of sweets in there which never made it to my kids but were yummy! 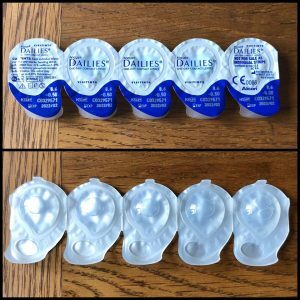 The lenses are all individually sealed in small sterile packets which makes it easy to use them as and when. 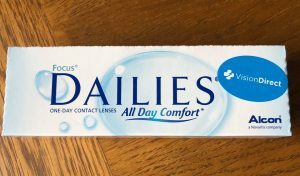 I also received some eye drops just in case I felt any initial discomfort with the lenses which again I thought was a lovely touch. As for wearing the lenses, I have to admit that my eyes flinched when I tried to pop the lenses in and it took me a couple of attempts. This is totally normal and they key is to just relax (as much as you can when you feel like you’re poking yourself in the eye!). Sometimes, popping them in in front of a mirror can help. 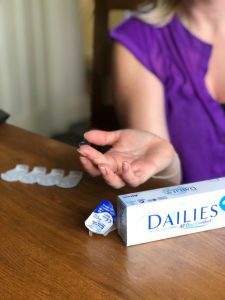 Once they were in, I couldn’t feel them at all but did choose to use the eye drops just to help them settle with it being the first time and I found them to be really refreshing. I wore my lenses all day with no issues at all and it was nice to have slightly sharper vision especially while I was driving. My overall opinion of the focus dailies is really good. 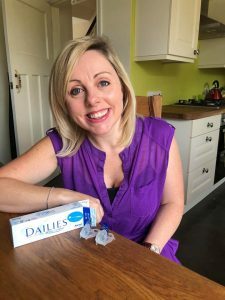 They promised clear and comfortable vision and that’s exactly what they delivered, really quickly and with great service. I would definitely use them again and recommend them to others! Written in collaboration with Vision Direct. All views are my own. I love these ones. So handy. It’s scary getting them out the first time too!!! 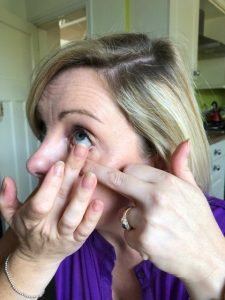 I’ve always struggled with the idea of inserting contact lenses. It’s good to read that you can’t feel them once they are in. Sharper vision while driving can only be a good thing! Definitely! My other half would say anything that helps my driving is a bonus. Charming! 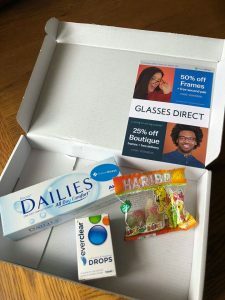 I love the fact they sent you sweets with the lenses, luckily I don’t need lenses or glasses (yet) but if i did these sound great.